Voice broadcasting is the delivery of a pre-recorded message to customers through an automated system, and it’s a very cost-efficient way to keep in touch with your current and potential customers as well as your employees. It enables you to reach thousands of people within few seconds without speaking directly to recipients. So, you can use this tool to generate more leads by phone. Use voice broadcasting campaigns to reach potential customers which can help boost sales, create leads and increase message deliverability. 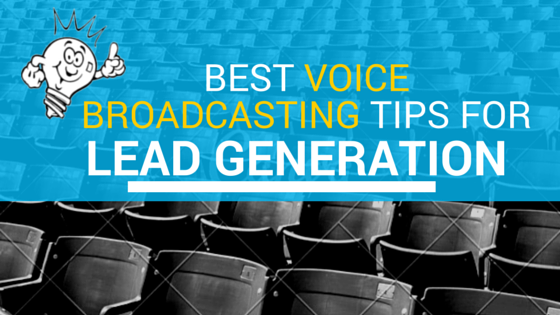 Below are some tips on helping your business generate leads with voice broadcasting. Below are some best practice tips to help you generate more leads with voice broadcasting campaign. According to your case study of above points design your campaign to achieve the goal & customers can engage with it. Before delivering your voice broadcasting campaign, you must define who you are targeting. The goal is to connect with people or business that have a good chance of being interested in your product, service, or the information you are about to provide. Targeting can be very helpful to make your message more personalized & effective. Your voice broadcasting message should be ideally 30 seconds. If you want to get the leads then opening sentence of your voice message must grab recipient’s attention by addressing your target correctly. Here are some introductory ideas. For more best practice tips to create an effective voice broadcasting message, Click Here. Your message should sound like you’re talking to someone and not reading from a script. Message should not be overly energetic. Message should generate customers interest so they will start asking questions. You should also mention an attractive offer, if any. It can generate more leads for you. With voice broadcasting campaign, one can encourage or allow the customers & audience to interact with your message & respond instantly. It is a great way to keep our recipients engaged. Getting a response is a key to successful lead generation. Provide a choice to connect like “Press 1 to connect with a sales person” This works well in generating leads. Make it as easy as possible for your target audience to act. So, voice broadcast is an effective & simple way to convey your message with a highest possible reach & inspire people to take your desired action which will increase your response rate. Also Read: How to Generate Leads With Minimum Investment?